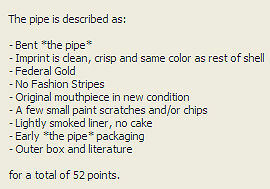 The value of pipe #521 is 52 points. It's always nice to have a pipe in the original box with literature, so when Dave and Mary Huelsing (mhuelsing) offered this beauty on eBay, I determined to have it. The bidding was quite spirited, but I ultimately prevailed. The pipe has been smoked only once or twice and I feel lucky to have it in the collection. I got an unsmoked specimen with the mouthpiece sticker still on it, so I gave this one to Bill Moore who has been incredibly generous to me.